With the knowledge that health risk factors for Native American youth are higher than the general population in South Dakota, "wellness" is the idea of teaching our students good eating habits and encouraging regular exercise. Our education efforts will focus on healthy eating, healthy food preparation and the merits of physical activity. Student success in St. Joseph’s residential setting includes supporting stronger relationships with families. Our efforts to strengthen family integration will include going out and listening to the families we work with, while taking a fresh family-focused look at everything we do. Our staff will take special care to engage families through yearly visits, effective listening, needs identification and strategizing ways to meet needs by connecting families to available resources at St. Joseph’s and in their local communities. 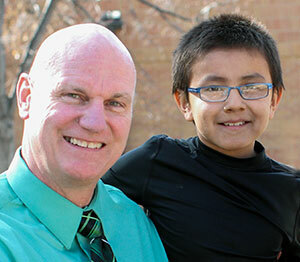 Mike poses outside with a student at St. Joseph’s Indian School in Chamberlain, South Dakota. There are a number of initiatives already in place that will need further attention in this new strategic planning cycle. These initiatives, regarded as important in serving the Mission, are laid out in specific goals. Some of the focal areas in this section are updating and enhancing the school library, refining the plan for pet therapy across campus and assessing our cultural and spiritual efforts throughout St. Joseph’s. We have grown tremendously the past 90 years and we look forward to 90 more. Thank you for your support of St. Joseph’s Indian School. Without you — our tiyospaye — extended family — none of this would be possible!